Microfinance is the provision of small loans to those who, because of the effects of poverty, cannot access mainstream finance. These loans are often essential for people to provide for their families' needs. The loans may be as small as $50 but can totally transform a life, a family or a community. The loan can restore dignity and provide a 'kick-start' to people that have an entrepreneurial streak but no pre-existing resources. Our goal is to promote economic empowerment for both the poorest of the poor, and those who, with assistance, have the capacity to contribute to their community and the economy. And the great thing about microfinance is that the same pool of money can be lent out again and again and again! 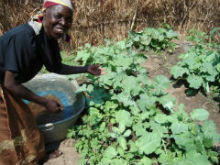 For full details, see our Global Microfinance Fund page.